To read this article at the Sun News, please click here! Interior Department is opening up about 1,900 square miles of ocean off the Carolinas’ coast to the possibility of wind turbines, with a lease auction to take place perhaps as early as next year. Click on the image to view the PDF. 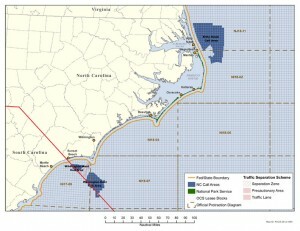 If you’re not an avid reader of the Federal Register, you may have missed the announcement yesterday that the Interior Department is opening up about 1,900 square miles of ocean off the Carolinas’ coast to the possibility of wind turbines, with a lease auction to take place perhaps as early as next year. It’s good news for North Carolina, which was the focus of the announcement, but it could also be good news for South Carolina, particularly the Grand Strand. Two of the areas lie due east of the Myrtle Beach area. North Myrtle Beach and its North Strand Coastal Wind Team have long been trying to position itself to take advantage of any wind industry, and this could be the city’s chance to get in on the ground floor. Depending on how serious things get and how realistic this becomes, it could also be a good opportunity for the Myrtle Beach Regional Economic Development Corp. (they really need to get a shorter name) to step in and flex their muscle. Some big issues remain: Who’s going to buy the power? It’s still more expensive than most of what’s produced and will likely require states to require a certain percentage of its power come from renewable sources, something that South Carolina hasn’t yet done. A federal tax credit for building wind turbines also expires at the end of this year, which could prove another hurdle. But let’s be optimistic for now. It’s at least some movement forward for renewable energy and it could mean more jobs for the area. Those are things to celebrate.